Be ready for the range and ready for the future, with this two-in-one set of Full-Metal Surplus-Style Ammo Cans from Boomstick Accessories. With a can for .30 cal, and a can for .50 Cal, you’ll have a storage solution for almost everything, in one shot. And you get the security of using real metal cans, not the cheap stuff! Easily combine with Dry Packs Liners for a weather-proof seal that keeps your ammo fresh for years! Order today, and get that ammo sorted out! Stash and carry your 30 and 50 Cal ammo the right way, and stay safe and ready for anything! 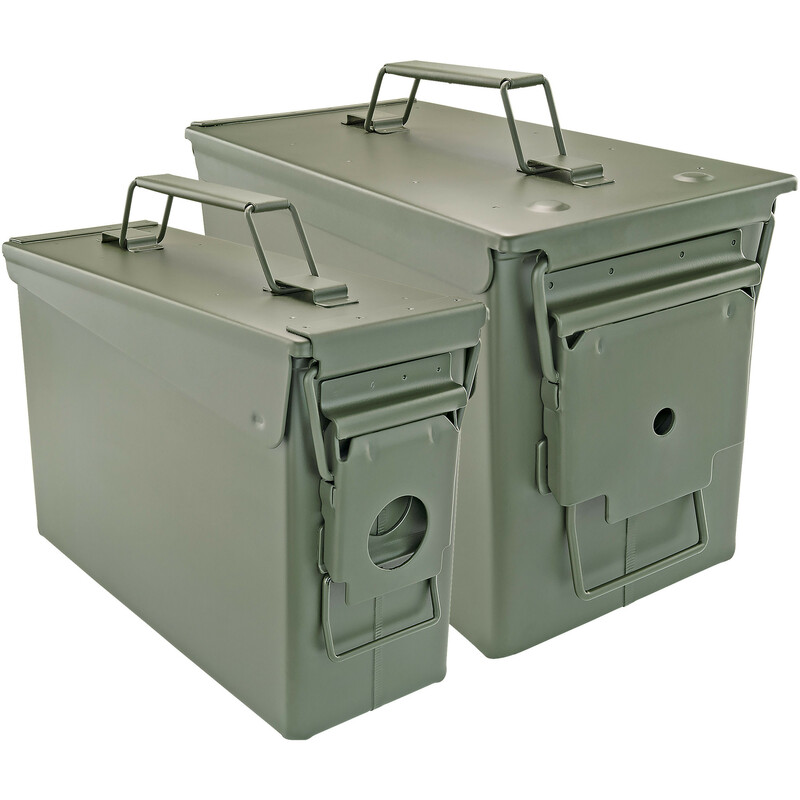 - With your set of 30 and 50 Cal Ammo Cans from Boomstick Gun Accessories, your brass is shiny and your storage system just works. Period. These classically styled boxes come in OD green, and live up to the hype. At the perfect size and thickness for 30 and 50 Cal, you can trust you’ve got the right solution for all your ammo storage needs. We’ve all been there. You put down hard cash during that sale, and bring home so much 30 and 50 Cal Ammo that you need a dolly just to get it out of the truck. Great. But is it going to be safe and ready in 3-6 months? Maybe… that depends on how you store it, huh? Well, don’t be the guy that makes the whole club nervous. Instead, store your ammo properly and have the shine that you practically hear! Not to mention that you can also store a whole range of goods for camping, tailgating, or whatever you can dream up. Yep. There’s nothing like the real thing. It’s the guaranteed way to keep things fresh, and have what you need, long term. Grab your cans today! Add to your collection, or start doing things the right way, right now! Enjoy! Can is brand new and is not used surplus. Includes one .30 cal and one .50 cal ammo can. Works best when combined with Dry-Packs brand VCI ammo can liners and Silica Gel desiccant products!! Can does have a rubber seal for airtight protection. Overall dimensions of the .30 cal can are 11.00" x 3.93" x 6.88". Overall dimensions of the .50 cal can are 12.00" x 6.06" x 7.50".